Abstract | This artist-response essay examines some ethical and aesthetic contours of media-theoretical hoaxes (and of a hoaxing media theory). I accomplish this through an exploratory reflection upon my own experiences and dilemmas as a media hoax artist, a vocation that has been influenced by Harold Adams Innis’s “authentic” scholarly persona as well as by McLuhan’s “probing” methods. Whereas recent work in the field of hoax art has tended to rely on the eventual text-bound revelation of the truth of the situation, my McLuhanite method aims rather towards magic and mediation. Résumé | Cet essai et réponse d’artiste examine quelques contours éthiques et esthétiques des canulars médiatiques (et d’une théorie des canulars médiatiques). J’accomplis cela à travers une réflexion exploratoire sur mes propres expériences et dilemmes en tant qu’artiste de canular médiatiques, une vocation qui a été influencée par la personnalité académique « authentique » d’Harold Adams Innis ainsi que par les méthodes « exploratoires » de McLuhan. Alors que les travaux récents dans le domaine de l’art du canular ont eu tendance à dépendre de la révélation éventuelle de la vérité de la situation, ma méthode McLuhanite s’appuie plutôt sur la magie et la médiation. It’s a commentary on our extreme cultural lag that when we think of criticism of information flow we still use only the concept of book culture, namely, how much trust can be reposed in the words of the message. The content of every Harold Adams Innis is always another Marshall McLuhan. The world itself has become a probe. – Marshall McLuhan (From Cliché 12). I never meant to bamboozle. I have just enjoyed the ways that things can get in the way—on stage, on record, online, on the air, on the street. Possibilities can be opened and unexpected pathways can be paved; directions one never thought possible can be made to cascade out into blooming black tops. I have not meant to conceal (I would not know where to start) but rather to embrace, which often involves only desiring and wondering: Wouldn’t it be fun? Marshall McLuhan’s mischievous printed matters and performances have offered insight and inspiration. Although notions of “the real” and “the true” ironically haunt contemporary hoax artists, the approach that I have borrowed reimagines the rules of this game—which can measure less than they engender and can signify less than they amplify. McLuhan offers a light for hoax artists who want not to lie but merely to have lain with others across the techno-cultural termini of all that might be, or become, or have been becoming. First there was Henry Thomas, the actor who played “Elliott” in ET: The Extra-Terrestrial, who I decided not to research except for the sparsely narrated filmography I found on the Internet Movie Database. I knew only his image—a sweet face and voice that could have been mine, more or less, from a certain distance. Wouldn’t it be fun if “Henry Thomas” was from Southwestern Ontario and has decided to move back home to focus on his songwriting? The Boy from ET was not a matter of obscuring, concealing, and then revealing. I saw myself rather putting into motion branching streams of possibility, joining myself up with an image and rummaging around, scavenging what I could and fabricating what I could not, and placing my final findings for pleasure within the reach of others. When “Henry Thomas” proper messaged me through MySpace and asked me to stop, I learned that his own version of “The Boy From ET” was also trying to make it as a singer-songwriter, which is an incredible coincidence. I eventually obliged him by adding a disclaimer and we both went onto our separate ways (see www.myspace.com/theboyfromet and www.myspace.com/henrythomasmusic). In 2010 my interests shifted from former child stars to the concept of the folk. I wondered if it would be fun to have discovered tapes recorded in the 1970s by “Staunton R. Livingston,” the iconoclastic Canadian folklorist who believed that culture was common property—and also believed that, if one wanted to document authentic Canadian folklore, one would need to scour the teams of the Canadian Football League for the players’ tales, legends, and songs. (I could not have been sure why “Livingston” believed this, because he did not write or publish, but he was committed to the belief as far as I could discern.) Wouldn’t it be fun if these folk songs of the Canadian Football League evinced a remarkable perspicacity regarding the universality of boredom and drudgery, yet also the possibility of redemption via solidarity, under late capitalism? Fun, too, if some of the coaching staff of the University of Toronto varsity football team came out to a performance, curious about this historical wormhole, asking excellent questions after the show? It was, indeed, very fun (see www.thecflsessions.ca). My dreaming has most recently been pulled by the possibility of an intelligent machine having decisively passed the Turing Test in Dawson City, Yukon (see www.folksingularity.com). With the help of Czech computer programmer “Mirek Plíhal” and Canadian songwriter Mathias Kom, I desired to have constructed an artificially intelligent database of folksong that can both comprehend the totality of the Canadian folk archive and simultaneously generate new yet hyper-authentic works based on the source data. (In honour of my favourite communist folklorist, we named this machine LIVINGSTON™.) There were some glitches and errors, to be sure, but we nonetheless managed to redirect media evolution towards less spectacular and more egalitarian (and weirder) ends, a task as difficult as it was fun (see Svec, “From the Turing Test”). Obviously, there can be multiple yearnings involved in any act of communication, including a hoax performance, and for me they have not always aligned. For instance, once, in Toronto, I was kicked in the leg by a well-known playwright when I let it slip, after a show, that I was not actually an accredited folklorist and that there was not actually a basement in what I had been calling “The National Archives”. Another time, in North Bay, on the day after I had autographed several CDs for artificially intelligent Canadian folk music fans at the White Water Gallery, I received an email from someone who had heard that my explanation of artificially intelligent folk music given in North Bay was an elaborate hoax and would I please clarify. I wrote back that I would not describe it that way, and we left it at that. But I was stricken with grief and with shame: my hard work of guiding others through fields of possibility had been ricocheted back to me, reappearing now only as obstruction or shroud. Having recently received a doctorate for a not-entirely-unrelated body of researches, I felt guilty in North Bay, even if the presentation I had offered occurred on stage in an art gallery and not in a university or at a folklore conference. In one of Marshall McLuhan’s many media appearances, he is especially elusive. Audience members pose questions about the sage’s controversial and famous pronouncements, while the English professor slowly spins in his chair, lobbing probes: “I have no point of view. See, for example, now, I couldn’t possibly have a point of view—I’m just moving around,” he more or less explains (globalbeehive). McLuhan makes the non-articulation of a clear position into a playful Great Refusal. He will not serve print-oriented logics. At least, he would prefer not to. The corporeal and inter-subjective modes of communication and awareness fostered by “cool” media demand multiplicitous modes of perception and exposition (see McLuhan, Understanding), which McLuhan’s complex personae, performances, and texts aim to open. As McLuhan himself put it in The Medium is the Massage, “The main obstacle to a clear understanding of the effects of the new media is our deeply embedded habit of regarding all phenomena from a fixed point of view” (68). Yet McLuhan’s splintered optics and playful modes of exposition, if logically consistent and rhetorically necessary, famously sat unwell with many of his contemporaries, despite (or perhaps because of) McLuhan’s mainstream successes. As Theodore Roszak declared, “McLuhan’s assertions are not, he would have us believe, propositions or hypotheses. They are ‘probes.’ But what is a ‘probe’? It is apparently any outrageous statement for which one has no evidence at all or which, indeed, flies in the face of obvious facts” (268). McLuhan’s method from this angle seems nothing but charlatanism—a spectacular show for the spotlight. Even critics sympathetic to Canadian media theory sometimes prefer to see McLuhan as an inauthentic echo of the originary source, Harold Adams Innis. Such distinctions appear both intellectual and personal. Consider James W. Carey’s opening to his influential essay on Innis: “During the third quarter of this century, North American communications theory—or at least the most interesting part—could have been described by an arc running from Harold Innis to Marshall McLuhan. ‘It would be more impressive,’ as Oscar Wilde said while staring up at Niagara Falls, ‘if it ran the other way’” (109). Carey goes on to render Innis as an un-commoditized hero with integrity, swimming against fashions, currents, and colleagues. Using words and phrases such as “commitment” and “revolt” and “ransacked experience without regard to discipline” and “rescued” and “freed” and “attempted to restore” (114), Carey paints Innis with vigor and virility. Although McLuhan has been given his due since the backlashes (we have recently seen edited collections, conferences, and centenary celebrations), it has seemed to me that, at least in water-cooler discussions in subterranean folk-music archives, one of the two progenitors of Canadian media theory is rendered as committed intellectual, the other as celebrity sellout. One toils away in relative obscurity, bucking trends and pursuing truth, the other riding his predecessors’ coattails, making cameo appearances in films and spinning in his chair on television. I am not endorsing these judgments but am merely pointing out that they have had some weight, durability, as Innis himself observed of oral dialogue in The Bias of Communication. However, personas and the affects they let loose, like arguments articulated in academic monographs or journal articles, are raw materials for the hoax artist. Thus, both ideas and performances are to be found in the “Toronto School” of Canadian media theory, both content and media, which just so happen to have drawn me out of the ethical impasse I encountered in North Bay. Innis’s and McLuhan’s convergent theoretical propositions and their divergent styles of being and thinking together make up a palette of signals and noises in which we can find both truth and hocus-pocus, both authenticity and that against which it has historically been defined, and in potent combinations. I had already been toying with Innis’s work and with the myth of the committed rebel-scholar. Consider the biographical details of “Staunton R. Livingston,” the character whose recordings of CFL players singing authentic Canadian folk songs I claimed to have found in the basement of “The National Archives,” and after whom I named my artificially intelligent folk database, LIVINGSTON™. Staunton R. Livingston was born and raised in Windsor, Ontario (is there a more authentic city? ); he was an autodidact who briefly studied at the University of Toronto but who dropped out before taking his degree (Innis was one of his teachers); he was a communist folklorist who did not publish or hold an academic position; and he died in 1977 in Trois-Rivières, QC of heart failure. Like Innis, Livingston was a “marginal man” (Watson), on the outside looking in, paying little attention to disposable and external processes of validation or accreditation. Livingston was a truthful seeker of truth, a capturer and assembler of real voices; he refused even to write or to publish, thoroughly committed as he was to the arts of orality and phonography. Audiences seemed to love this side of our hero and to desire more reliable information. If you were to take the tapes that Livingston made of CFL players in the 1970s, if you were to lay these tapes across the ground, and if it were possible to see on tape the grain of the music, you would see nothing but this grain on Livingston’s tapes. It would not be possible to see, there, the lack that is the opposite of the grains of music. This means that to listen to The CFL Sessions is not to hear a singer who is simply passing on a song. If we follow the path Livingston has laid out for us, in The CFL Sessions we can hear the singer become something other than a mere channel of a message; we can hear the singer reach towards communion—an instrument for itself and yet longing for others. Sound, in this light, has a utopian ringing built into it, which magnetic tape recording has a unique ability to locate and magnify. Livingston’s use of phonography—given that he did not record for a record label or even for a public institution—can thus be understood as a folk approach to folksong collecting: he figured himself as a pure reservoir for pure reservoirs, a clear window for clear windows. So the legend goes, I claimed. Signals can get crossed, however. Clearly smitten with Livingston’s life and methods, I myself (Livingston’s legacy’s caretaker) tended to misuse my sources, variously reading too far and not far enough (see www.folksongsofcanadanow.com/). In speaking and in making digital archives, and in writing and singing, I tended to get in the way. The work of a “Gutenberg man [sic]” (McLuhan, Gutenberg), my academic discourse contended with Livingston’s implicit pleas for being together, for I essayed too much (see http://www.folksingularity.com/faq.html). I could often see it in my audience’s glazed-over eyes—could feel the disdain and, sometimes, contempt for their too-tight relay. They wanted Livingston, and his Folk, but were stuck in the middle with me. And yet, in spite of the calculated incompetence of his progeny, even and perhaps especially when our “cover” was blown, Livingston’s method functioned across both time and space. Some kind of authenticity echoed out and away from our ceremony (and from all its other incarnations), in which folk-singing footballers can sing and revel and make poetry, and in which technology can be recalibrated towards human and un-commoditized ends. “Don’t let the sound of your own wheels make you crazy,” as the machine LIVINGSTON™ wrote in “Take It Easy But Take It to the Limit,” ironically entranced therein by its own powers of composition. Which is to say that in spite of the glitches and noise communion was made to happen. No lie. I could feel it. In my experience, it is impossible to predict how an audience will react, but it seems to me that ideal auditors have suspected, doubted, believed, wondered, accepted, delighted, and revolted altogether. As the contemporary McLuhanite media theorist Siegfried Zielinski puts it, “It is of vital importance to know that a magical approach toward technology continues to be possible and to be reassured that investment in it is meaningful” (Deep Time 255). Thus for me it was important not to include in my work a hoaxer’s reveal. Zielinski again: “When the spaces for action become ever smaller for all that is unwieldy or does not entirely fit in, that is unfamiliar and foreign, then we must attempt to confront the possible with its own possibilities” (Deep Time 11). Livingston’s radical phonography and LIVINGSTON’s authentic archive are only two possibilities within late-modern media culture, but I wanted to foreground them—and to make them both real and durable. Yet, “hoax art” has often tended to require a moment of unmasking, a moment at which the personas are deflated and at which the true meaning or intentions of the artist are revealed. According to Chris Fleming and John O’Carrol, this strategy makes hoaxes an inherently educative type of text or performance: “Like irony, the hoax means the opposite of what it says and its ultimate truth, if we are still brave enough to talk in these terms, depends on its falsity being taken for truth. The deception, in this respect, is temporal and temporary—the hoax is no good if it cannot, at some stage, be revealed (unless, of course, the aim is simply to defraud)” (48). Fleming’s and O’Carrol’s theorization of the hoax draws on Jacques Derrida’s engagement with J.L. Austin; although they acknowledge that hoaxes operate across numerous genres and can exist as texts or performances, they see the hoax as a primarily parasitical (and inherently discursive) form of communication. “Hoaxes are at once textual and metatextual in their strategies of attack” (57), they write. Some of the most high-profile hoax artists of late would seem to agree with Fleming and O’Carrol about the inherent textuality and metatextuality of the form as well as its educative function of writing truth to falsity. One of the most visible practitioners, The Yes Men, have especially required moments of unmasking in which their deconstructive intentions have been revealed. They spend weeks or months or days joining up with and inhabiting various media apparatuses and ideologies; setting truth and representation aside, they meld their bodies and clever faces with the military-industrial-entertainment complex in a way that foregrounds and heightens its absurd logics and tendencies (see Hynes, Sharp, and Fagan). But the satirical function of The Yes Men’s performances requires a moment at which we realize that it has all been a polemical act: masks are stripped away, costumes discarded, and they finally help us to see their point of view on the global consequences of various neoliberal policies. In other words, despite their clear knowledge of and investment in the tactical guidelines of media theory, the knowledge that The Yes Men have to offer is a print-based and visual knowledge. In their first documentary The Yes Men (2003), for example, while explaining their mission and role one of The Yes Men points to stacks of printed newspapers and magazines that have covered their antics, implying that their real work is the drawing of attention (using media stunts) towards print-based argumentation. Another influential and famous hoax artist, Iris Häussler, has also required a moment of unmasking, though as a visual artist she is motivated by a different set of disciplinary concerns than The Yes Men. Gilles Deleuze’s claim that “[e]very actual surrounds itself with a cloud of virtual images” is concretized in her expansive artworks (Deleuze and Parnet 148), which invite the viewer into apparently limitless worlds. I had the good fortune of attending Häussler’s He Named Her Amber (2010) at the Art Gallery of Ontario. After being led through an exquisitely detailed excavation site at The Grange by a guide who explained and recounted the most fanciful of historical tales in a way that made the story feel all-too-real, we were given a letter by our tour guide and sent on our way. It was in this letter, on this page, that we learned of the artist’s imprint on the site and narrative: “Finally revealing the fictitious nature of Amber’s story—after a time of reflection—is absolutely as much a part of my artwork as constructing the story is in the first place” (Häussler, “Disclosure” n.p.). In reading the artist statement, which according to Häussler is necessary, the expansive “cloud” of virtualities were thus cast into the dustbin of the individual imaginary of a single creator. I admire both The Yes Men and Iris Häussler (and even Alan Sokal), and also recognize that they are in different leagues than my poor folk. But for me the hoax is not a text, nor should it end with one. It is ritual, enchantment, and community. It is a bringing together and a making possible, not a lie but a kind of hocus-pocus, which is the originary meaning of “hoax.” According to Fleming and O’Carroll, many contemporary media and academic hoaxes have an educative function: “[The hoax] commences with the premise that it has superior knowledge of some kind” (57). However, following McLuhan’s lead(s), my kind of hocus-pocus is not so severe or print-dominated, because it does not reveal superior, discrete knowledge from an authentic margin, or even articulate a point of view. I am rather joining up with others, including machines, and expanding, multiplying, and thickening (or at least trying). “A moment of truth and revelation from which new form is born,” as McLuhan observes of media hybridization in general (Understanding 80). Similarly, the unrevealed hoax is not necessarily untrue, and does not need to be framed as such. It is rather a new form of truth—a new kind of revelation. But can I get a witness? I’m gonna dig a tunnel. Who will join in this ceremony of witnessing, digging, singing, and sounding? Who will join in this ceremony of burning? 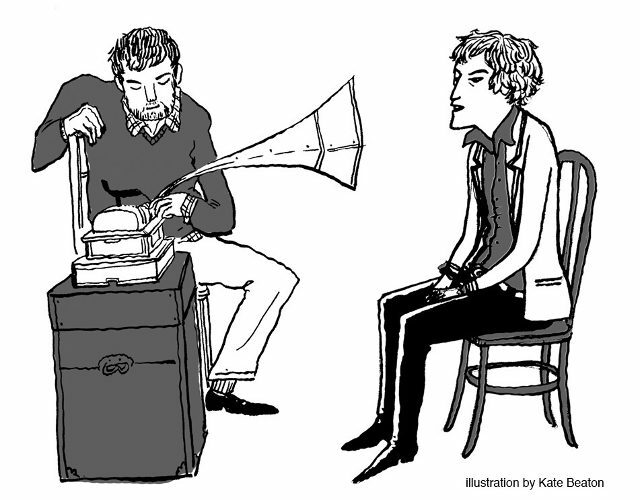 Featured Image: Kate Beaton, The Song Collector 2011. Bendix, Regina. In Search of Authenticity: The Formation of Folklore Studies. U of Wisconsin P, 2009. Carey, James W. Communication as Culture: Essays on Media and Society. Routledge, 1992. Deleuze, Gilles, and Félix Guattari. A Thousand Plateaus: Capitalism and Schizophrenia. Translated by Brian Massumi, U of Minnesota P, 1987. Deleuze, Gilles, and Claire Parnet. Dialogues II. Translated by Hugh Tomlinson and Barbara Habberjam, Continuum, 2002. Fleming, Chris, and John O’Carrol. “The Art of the Hoax.” Parallax 16.4 (2010): 45-59. Häussler, Iris. “Disclosure (Excavation Notes 01/2009).” Iris Häussler, http://haeussler.ca/amber/artist.html. Accessed 10 October 2016. —. He Named Her Amber. Toronto: Art Gallery of Ontario, 2008-2010. “Henry Thomas.” The Internet Movie Database. IMDb.com, Inc, n.d. Web. 1 Oct. 2017. <http://www.imdb.com/>. Hynes, Maria, Scott Sharpe, and Bob Fagan. “Laughing with the Yes Men: The Politics of Affirmation.” Continuum, vol 21, no. 1, 2007, pp. 107-121. Innis, Harold Adams. “A Plea for Time.” 1951. The Bias of Communication. U of Toronto P, 2003, pp. 61-91. —. Empire and Communications. U of Toronto P, 1972. Innis, Harold Adams. The Bias of Communication. 1951. U of Toronto P, 2003. Keightley, Keir. “Reconsidering Rock.” The Cambridge Companion to Pop and Rock. Edited by Simon Frith, et al., Cambridge UP, 2001, pp. 109-142. LIVINGSTON™. “Take It Easy but Take It to the Limit.” Artificially Intelligent Folk Songs of Canada, Vol. 1. Independent, 2014 [www.folksingularity.com]. —. “Winter Is Cold and Good.” Artificially Intelligent Folk Songs of Canada, Vol. 1. Independent, 2014 [www.folksingularity.com]. Miller, Karl Hagstrom. Segregating Sound: Inventing Folk and Pop Music in the Age of Jim Crow. Duke UP, 2010. McLuhan, Marshall. Counter-Blast. McLelland and Stewart Limited, 1969. —. From Cliché to Archetype. The Viking Press, 1970. —. The Gutenberg Galaxy: The Making of Typographic Man. U of Toronto P, 2011. —. Understanding Media: The Extensions of Man. 1964. Edited by W. Terrence Gordon, Ginko Press, 2003. McLuhan, Marshall, and Quentin Fiore. The Medium is the Massage. 1967. Ginko Press, 2001. Peterson, Richard A. Creating Country Music: Fabricating Authenticity. U of Chicago P, 2013. Roszack, Theodore. “The Summa Popologica of Marshall McLuhan.” McLuhan: Pro & Con. Edited by Raymond Rosenthal, Funk & Wagnalls, 1968, pp. 257-269. Sterne, Jonathan. The Audible Past: Cultural Origins of Sound Reproduction. Duke UP, 2003. Svec, Henry Adam. “FCJ-183 iHootenanny: A Folk Archeology of Social Media.” The Fibreculture Journal, vol. 25, 2015. —. “Folk Media: Alan Lomax’s Deep Digitality.” Canadian Journal of Communication, vol. 38, no. 2, 2013, pp. 227-244. —. “From the Turing Test to a Wired Carnivalesque: On the Durability of LIVINGSTON’s Artificially Intelligent Folk Songs of Canada.” Liminalities: A Journal of Performance Studies, vol. 12, no. 4, 2016, pp. 1-7. —. “Pete Seeger’s Mediatized Folk.” Journal of Popular Music Studies, vol. 27, no. 2, 2015, pp. 145-162. The Yes Men. Dir. Dan Ollman, Sarah Price, and Chris Smith. Perf. Mike Bonanno and Andy Bichlbaum, United Artists, 2003. Turing, Alan M. “Computing Machinery and Intelligence.” Mind, no. 49, 1950, pp. 433-460. Watson, Alexander John. Marginal Man: The Dark Vision of Harold Innis. U of Toronto P, 2006. Zielinski, Siegfried. Audiovisions: Cinema and Television as Entr’actes in History. Amsterdam University Press, 1999. —. Deep Time of the Media. The MIT Press, 2006. In addition to McLuhan, my methods owe much to the “imaginary” media research of Siegfried Zielinski (Audiovisions; Deep Time), who runs very far with the media-theoretical maxim that our communicative ecologies are contingent and thus could be otherwise. Perhaps not surprisingly, as Zielinski’s first major book Audiovisions made clear in a way that his more recent researches have not, he is a card-carrying McLuhanite. The work of Gilles Deleuze and Félix Guattari also informed my early attempts at hoaxing, in particular A Thousand Plateaus as well as Deleuze’s “The Virtual and the Actual,” an essay in his book of interviews with Claire Parnet, Dialogue II (148-59). Alan Turing’s famous examination is won when a machine successfully impersonates a human in the eyes of another human judge, performing not through the body but through the manipulation of symbols (Turing). So, given that it involved a human (me) impersonating a computer impersonating a human, my A.I. hoax was in a sense a hoax of an originary hoax. I have skipped over two of my hoaxes for brevity’s sake. I also claimed to have retraced the steps of folklorist Edith Fulton Fowke, re-documenting that which she once documented (see www.folksongsofcanadanow.com), and under a moniker (Staunton Q. Livingston) I appeared to have found a lost recording by Stompin’ Tom Connors that was influenced by The Beach Boys’ Pet Sounds (see www.loststompintomsongs.com). As I myself learned after a show in Ottawa, from an actual archivist at The National Archives, “The National Archives” is not even what that place is called (it is in fact “Library and Archives Canada”). It was from this kind archivist, too, that I learned about the lack of a basement there. In making these performances and in thinking about them now, I am indebted to so much great work in media and cultural studies on the discursive production of “authenticity.” See, for instance, Bendix; Keightley; Peterson; Miller. Thus Staunton R. Livingston is a carrier of what Jonathan Sterne has described as “the audiovisual litany,” a Christian ideology that identifies sound and hearing with presence and salvation, on one hand, and sight with alienation and individuality, on the other (Sterne 14-19). I very much had Sterne’s discussion of “the audiovisual litany” in mind when constructing Livingston’s approach to song collecting. I am indebted to Fleming and O’Carroll for pointing out that the ambiguous origins of “hoax,” according to the OED, includes “hocus pocus” (51). This article is licensed under a Creative Commons 4.0 International License although certain works referenced herein may be separately licensed, or the author has exercised their right to fair dealing under the Canadian Copyright Act.